A brand New Year has started. We extend our very best wishes to all our regular and new guests who visited throughout 2018. Are you are ready for making more great catches without ever being over-crowded and joining our Specimen and 1,000lbs Clubs? To the right, regulars will recognise that our resident frogs are relaxing before making their usual May/June appearance. We look forward to you visiting when it is a pleasure meeting you all. “Fishing only”, up to week-4 ahead, from Members. “Accommodation with discounted fishing” for 3, 4 or 7 days or longer. Angling Clubs are invited to Book for 2019. For the 2019 season, Manor Fisheries has changed to a limited Membership only Fishery for all fishing. If not already completed, now is the time to apply online for your 2019 Manor Fisheries Membership at https://www.manor-fisheries.co.uk/night-fishing/. The limited Membership does not apply to Lake 3 (Mixed) Concessionary anglers, those under 18 years in age (who must be accompanied by a 2019 Member), Angling Clubs or those booked with an Apartment. 1. A 2019 Member with a valid membership number in advance of their Booking Request. In addition to the published charges for fishing, the annual 2019 Membership fee is £20.00 which provides the option to book fishing for day and/or night fishing throughout the Manor Fisheries 2019 Season. Some dates for your 2019 diary. See Anglers Mail dated 18 & 25 December 2018 when Manor Fisheries was again selected a South East Where to Fish Venue of the Year. Three very well stocked lakes, two specimen, containing carp to 30 lb, lots of catfish to 50 lb and some big perch to 4 lb, tench and bream. Excellent accommodation for angling families right next to the lakes plus a cabin with toilet and a small kitchen area with microwave, and a rod room for tackle, bait and wet clothes. Management of Lake 3 (Mixed) through netting and electro stunning. A new and improved on-going daily winter fish feeding programme using an initial 1,000 Kg of high quality of feed for Lakes 1 and 2 and an initial 200 Kg of the usual feed for Lake 3. We look forward to keeping you informed of progress and receiving your comments and/or ideas. The upgraded swims contain concrete and the use of a rod pod is ideal. 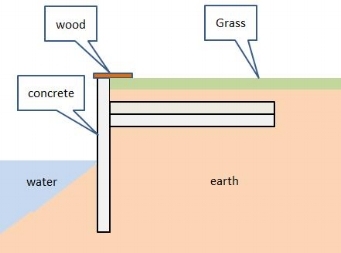 Although the use of bank sticks is still fine, when fishing near to the water’s edge please avoid damage through banging into the concrete which will also scare the fish away from your swim. Alternatively you can locate your rods (and bank sticks) further back from the water’s edge to completely avoid the concrete. 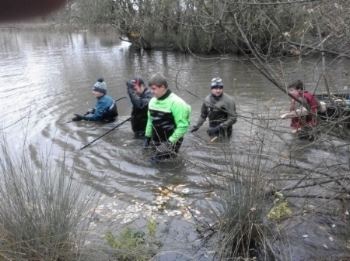 Lake 2 (Carp/Catfish) – A Hadlow College team of eight, led by Brian Bailey - Commercial Fisheries Manager, arrived on Wednesday 5th December equipped with both Seine nets and electro-fishing equipment. The focus was on removing smaller Cats and 28 x Cats weighing a total of 281 lbs were successfully removed for rehoming. In addition 14 x small Carp weighing in total some 15 lbs were relocated to Lake 3 (Mixed). 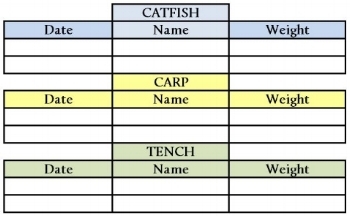 In the event these “Target weights” are not met, the above prizes will be awarded for the heaviest verified Carp, Catfish and Tench specimens recorded in the Cabin Log Book by or on Sunday 29th September 2019. In addition to recording Cats weighing over 30 lbs, and please don’t be shy ……. we request anglers also record Carp over 20 lbs as this forms the basis of our Monthly News Report and provides valuable input to our lake management plans. Thank you to all those anglers who have spent a few moments in the past to summarise their catch in the Cabin Log Book. "Take a break with the Family" is the headline when Duncan Charman highlights Manor Fisheries in his article dated 31st July 2018 and illustrates Tom Watson enjoying the results of his catch. See pages 22 and 23 in Angling Times dated 12 June 2018 for a "Where to Fish;Extra" article that features Manor Fisheries. See Duncan Charman's article “Where To Fish – South East” and published in Anglers Mail dated 3rd April 2018. In the News twice this week - see Anglers Mail 12th September 2017 page 9 “Bill Phillips bagged 1,064lbs of Catfish to 40lbs in 89 hours” and pages 20 to 22 “Bill Rushmer’s Brilliant Baits” for Cats. See 18th July 2017 articles in Anglers Mail "Where to Fish - South East" and Angling Times "Where to Fish - South". See Angling Times 16th May'17 article "100 Best Lakes to fish this Spring" that includes Manor Fisheries. See Angler's Mail 7th March'17 "Best of the Best" fishing article including Manor Fisheries. Fabulous Fishing in the Garden of England, Kent.